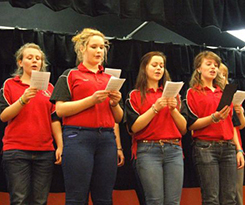 The Eisteddfod is one of the first competitions in our competitions calendar. Members come together to compete and show their talent for singing, reciting and playing instruments and the standard ensuring everyone enjoys every second. The evening session is light and humorous with sketches, humorous duets, miming and laughter! We also hold written and art competitions for members who are not so keen on being on stage. Once again we have something to suit everyone. We are also able to boast a fully bilingual programme which ensures that there are no limitations for the members. Sunshine and Stock-judging for the Shire! Pembrokeshire YFC are stars in Stafford!